Team effort...Borders Street Pastors has recruited volunteers from churches across the Borders to keep revellers in Galashiels and Hawick safe at the weekends. If you have been out in Galashiels or Hawick on a Saturday night, chances are you’ve already met the Borders Street Pastors. If you’re not out in the wee hours, though, you might not know much about the group, which was launched here in June 2016. On patrol...street pastors are out in Galashiels and Hawick on Saturday nights to listen, help and care for revellers and ensure they get home safe and sound. The Christian group was first founded in London in 2003 and there are now 270 street pastor crews across the UK, 22 in Scotland. The Borders group may be the newest but the 16-strong crew has quickly established itself in Gala and Hawick. In the space of just two short years, volunteers from churches across the Borders have given up 2355 hours on 155 patrols in the two towns. They’ve handed out 1275 pairs of flip-flops, 464 bottles of water, 7436 lollipops, 238 woolly hats, 79 foil blankets and eight ponchos. Safe haven...the Borders team have built up trust with local revellers and are now hoping to recruit more pastors to increase their presence in Hawick. In addition, they have cleared 3713 bottles and glasses from the streets, assisted with transport issues on 76 occasions and delivered first aid to 55 revellers. They have also called an ambulance for those in need on 21 occasions. And they’ve won many friends along the way too, not least members of Police Scotland with whom the pastors reguarly liaise. But the pastors are not there to report issues to the police – their sole purpose is to help people. Duncan Cameron, the Borders group co-ordinator, explained: “Listening, caring and helping – that’s our motto and philosophy. “We’re out on the streets every Saturday night in Gala, usually from 11pm to 3.30am, after the clubs come out. “And we’re out in Hawick once a month, patrolling at the Howegate and the town’s nightclub. “We’re there to help people stay safe. “We’re not there to do a police officer’s job – we deal with minor issues and help de-escalate situations. “Two lads, for example, were getting rowdy with each other one night and one of our pastors asked if they wanted a lollipop. “They both burst out laughing and immediately the atmosphere changed. Instantly recognisable, the pastors are often treated like minor celebrities by young revellers who very much trust the team. And the pastors enjoy their work too. Duncan said: “I’ve lost count of the number of hugs we’ve received or the selfies we’ve been asked to pose for. “They see us as a force for good and know we’re not there to judge them. “It’s all confidential – what happens on the streets stays on the streets. “We ask our volunteers to commit to one Saturday night a month but most of them would do more as they enjoy it so much. With just 16 street pastors, there is a limit to how many patrols they can take on. But Duncan is hopeful that more volunteers can be recruited to increase their presence in Hawick. And the team already has an eye on Hogmanay, when an extra patrol is also undertaken in Melrose. Duncan said: “We’d really like to do more patrols in Hawick. I have given a few talks at local churches in the hopes of recruiting more volunteers; it’s an issue we’re trying to tackle just now. “Often people say they can’t manage to stay out until 3.30am but we’d be delighted to hear from anyone willing to patrol until 1am. 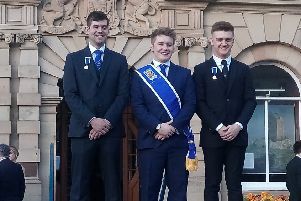 “We also have several volunteers who help us with day patrols at events ranging from the Melrose and Earlston 7s to the Braw Lads Gathering in Gala and the Hawick Common Riding. Volunteers undertake 50 hours of training over a two year period, with a full day roles and responsibilities course being their initial commitment before joining the team on the streets. Anyone interested should email borders@streetpastors.org.uk. In the meantime, the pastors are gearing up for one of their busiest times of year – Hallowe’en and the festive season. Duncan added: “One of the busiest nights of the year in Galashiels is Hallowe’en, or the Saturday night closest to it, with all the students donning costumes. “Christmas and New Year are also pretty busy but everyone is usually in good spirits so it’s good fun. “Often, the best part of the job is the conversations we strike up with people. To find out more about the street pastors and how you can help, visit streetpastors.org/locations/borders.